Please enter a valid telephone number. Only used if you win. We accept Mastercard, Visa and Discover only. 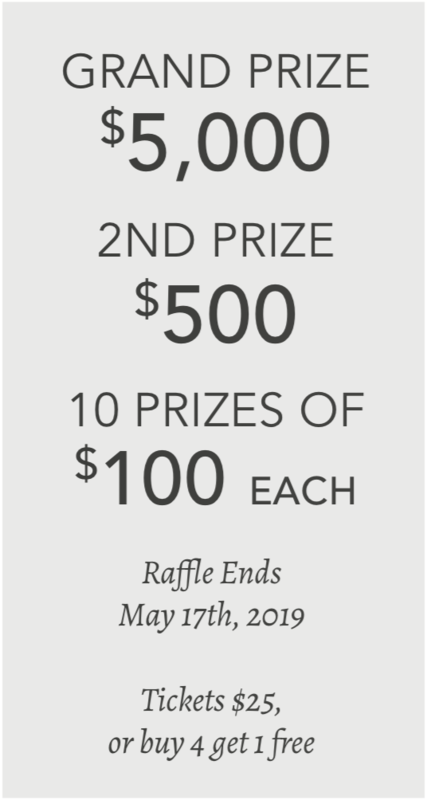 The Inmates Helping Inmates Raffle is open only to legal residents of the fifty (50) United States or District of Columbia who are eighteen (18) years of age or older at the time of entry. Grand Prize: One (1) raffle winner will receive $5,000. 2nd Prize: One (1) raffle winner will receive $500. 3rd Prize: Ten (10) raffle winners will receive $100 each. The winners need not be present to win. The winners will be randomly drawn on the closing date of the raffle. The winners will be contacted via telephone within five (5) business days of the drawing. Employees, officers, and directors of LADS Network Solutions, Inc., "GoRaiseDough.com" and their immediate families are not eligible to participate. Media sponsors, their employees and their immediate families are not eligible to win any prizes. LADS Network Solutions, Inc., "GoRaiseDough.com" and Catholic Charities of Southern Illinois maintains no control of the personnel, equipment or operations of any supplier and assumes no responsibility for any financial loss, personal injury, property damage, other loss, accident, delay, inconvenience or irregularity which winners may experience by reason of (1) performance/nonperformance by any supplier; (2) wrongful, careless, negligent, or unauthorized acts or omissions on the part of any supplier or its employees, or on the part of any other party not under the control of go raise dough or the non-profit organization; (3) any defect, breakdown or other failure of any aircraft, train, automobile, ship, accommodation, or other equipment or instrumentality owned, operated, or otherwise used by a supplier or; (4) any acts of god, acts or omissions of third parties, damage or loss associated with any terrorist activities, social or labor unrest, mechanical or construction failures, disease, local laws, climactic conditions, or other conditions or developments. LADS Network Solutions, Inc., "GoRaiseDough.com" and Catholic Charities of Southern Illinois shall in no event be liable for special or consequential damages arising from the use or ownership of the prizes. Participants hereby release the LADS Network Solutions, Inc., "www.GoRaiseDough.com" and Catholic Charities of Southern Illinois from and against any and all claims and liability for any loss, harm, damage, injury, cost or expense of any nature whatsoever (including attorneys’ fees) which may occur in connection with this raffle or any element thereof. All prizes are subject to, and the winners are fully responsible for federal, state and local income taxes. LADS Network Solutions, Inc., "GoRaiseDough.com" and Catholic Charities of Southern Illinois has no responsibility for the payment of any taxes associated with the prize (except for the responsibility to comply with the withholding regulations and requirements of the taxing authorities involved). The winners have fifteen (15) calendar days from drawing to claim their prize. In the event a winner is non-compliant with requirement, or if prize notification is returned as undeliverable, prize will be forfeited. The winners will allow LADS Network Solutions, Inc., "GoRaiseDough.com" and Catholic Charities of Southern Illinois the right to use their name and/or likeness for promotional purposes without further compensation. Catholic Charities of IL offers an innovative Literacy program for Inmates, where inmates tutor inmates with incredibly positive results. Studies show that 70% of IL inmates have reading difficulties. Without the ability to read, the odds of an inmate getting a job outside of prison drops dramatically. Studies show without adequate literacy, inmates return to prison over 80% of the time. But when an inmate completes the Catholic Charities Literacy program, the odds of that inmate returning to prison drops to only 12%. This is the biggest factor in enabling inmates to return to society as good and productive citizens. Inmates can improve as much as five grade levels per year and are stunned at the new world they’ve been missing, including improved faith in their daily life. They can read the Bible, sing along with the hymnal, and become a positive contributor in their communities for the first time and that is why they advance so quickly. For every inmate we educate and help to not return to prison, we save the State of IL $35,000 per year. The expense of Correctional Institutions is the 2nd largest budget item for our state. Please help us change the lives of these inmates by becoming literate, which in turn helps them become good and productive members of society, improving families and communities, while we help reduce our state budget for correctional institutions. If this fundraiser does not sell 500 tickets, it will automatically convert to a '50/50 after expenses' raffle with the winners receiving their pro-rata share of the winnings.